What happens when four city slickers with a shared love of good food, ‘70s music, and the north woods of Minnesota get a wild idea? 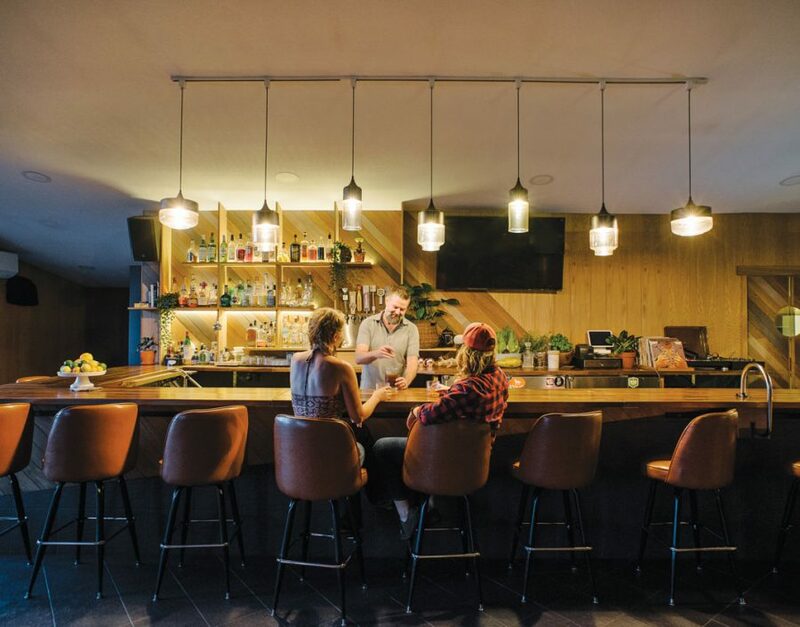 They buy a seriously neglected lodge on the Gunflint Trail and turn it into a fresh, soulful getaway that’s as welcoming to weekend road trippers as it is to locals who rely on it as a gathering spot during long winters. Owners Bryan and Stacey Gerrard, and Kippy Kuboy and Lynse McDonough purchased the property last year after Bryan stumbled across it on a camping trip and saw untapped potential. They renamed it Poplar Haus and set out to revamp the tired property and usher it into a new era. The main lodge was gutted and redesigned with the assistance of Kristin Rackner of Studio Vice in Minneapolis, who helped refine the couple’s vision. “We wanted to bring something new to the area and create a place with great design, music, food, and cocktails,” Bryan recalls. If online reviews and bookings are any indication, they’ve hit the mark. The new space is open and bright, with a restrained ‘70s vibe and surprising design touches throughout that include a dramatic black fireplace, sculptural copper pipe chandelier by Space Craft MN, and Rovan Handcrafted custom woodwork in a subtle geometric pattern—a modern interpretation of a groovy basement bar. The restaurant has owner/chef Kippy at the helm making elevated versions of Midwest comfort food, while cocktails get an upgrade with local flavors and spirits. Meanwhile, Bryan puts his extensive vinyl collection and experience as a DJ to good use in the bar, setting the tone for a laid-back scene in one of Minnesota’s most scenic spots.